When designing a trading strategy, I want to make sure that small changes in the strategy parameters will not transform the profitable strategy into the loosing one. I will study the strategy robustness and profitability under different parameter scenarios using a sample strategy presented by David Varadi in the Improving Trend-Following Strategies With Counter-Trend Entries post. 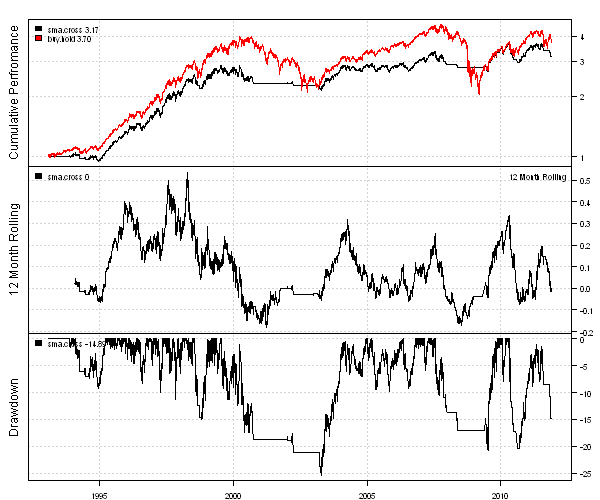 The Counter-Trend Entries (trend.following.dv1, black line) improved the performance of the simple Trend-Following (trend.following, red line) strategy: both returns are higher and drawdowns are smaller. 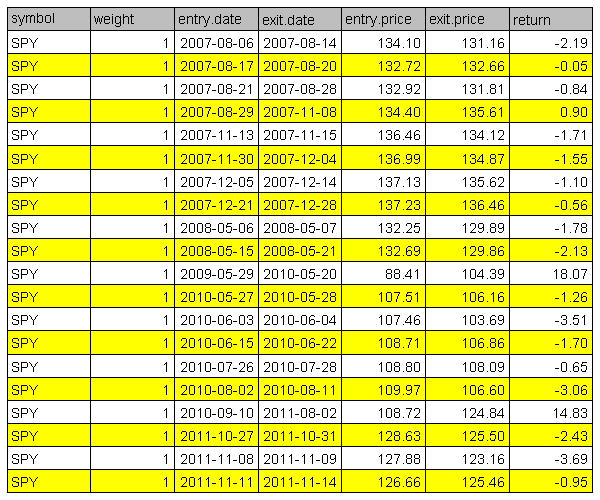 The first column, labeled “NO”, shows the performance of the Trend-Following strategy (no Counter-Trend Entries). The Counter-Trend filter improves the strategy performance for most of the parameter scenarios. This is the result you want to get by doing Sensitivity Analysis, the strategy is robust and profitable under variety of parameters. The next step, which you can do as a homework, is to examine the strategy performance with different instruments. For example, a more volatile Nasdaq (QQQ), or a Canadian S&P/TSX Index (XIU.TO). To view the complete source code for this example, please have a look at the bt.improving.trend.following.test() function in bt.test.r at github. I wrote a simple Backtesting library to evaluate and analyze Trading Strategies. I will use this library to present the performance of trading strategies that I will study in the next series of posts. To view the complete source code for this example, please have a look at the bt.test() function in bt.r at github. I want to review the series of posts I wrote about Asset Allocation and Portfolio Construction and show how all of them fit into portfolio management framework. Historical – estimate historical return, risk, covariance and assume that history will repeat itself. Ibbotson’s Building Blocks – estimate expected returns based on the risk premium. Please read Input Methodologies article by Morningstar for a detailed summary. The Black-Litterman model – estimate expected return using reverse optimization from current asset class market capitalizations. The robust estimation of covariance matrix is usually preferred. For example, the Covariance Shrinkage Estimator is nicely explained in Honey, I Shrunk the Sample Covariance matrix by Olivier Ledoit and Michael Wolf (2003). Introduction of new asset classes with short historical information is problematic when using historical input assumptions. For example, Treasury Inflation-Protected Securities (TIPS) were introduced by the U.S. Treasury Department in 1997. This is an attractive asset class that helps fight inflation. To incorporate TIPS, I suggest following methods outlined in Analyzing investments whose histories differ in length by R. Stambaugh (1997). The next step of the Asset Allocation process to create efficient frontier and select target portfolio. I recommend looking at different risk measures in addition to the traditional standard deviation of the portfolio’s return. For example, Maximum Loss, Mean-Absolute Deviation, and Expected shortfall (CVaR) and Conditional Drawdown at Risk (CDaR) risk measures. To select a target portfolio look at the portfolios on the efficient frontier and select one that satisfies both your quantitative and qualitative requirements. For example, a quantitative requirement can be a low historic drawdown, and a qualitative requirement can be a sensible weights. For example, if model suggest 13.2343% allocation to Fixed Income, round it down to 13%. I also recommend looking at your target portfolio in reference to the geometric efficient frontier to make sure your are properly compensated for the risk of your target portfolio. If you have a view on the possible future economic or market scenarios, please stress test your target portfolio to see how it will behave during these scenarios. For example read A scenarios approach to asset allocation article. Sometimes, we want to combine short-term tactical models with long-term strategic target portfolio. I think the best way to introduce tactical information into the strategic asset mix is to use Black-Litterman model. Please read my post The Black-Litterman model for a numerical example. The next step of the Asset Allocation process is to implement the target portfolio. If you follow a fund of funds approach and implement the target asset mix using external managers, please perform a style analysis to determine the style mix of each manager and visually study if manager’s style was consistent over time. We want to invest into the managers that follow their investment mandate, so we can correctly map them into our target asset portfolio. We can use the information from style analysis to create managers input assumptions. Let’s combine alpha and covariance of tracking error from the style analysis with asset input assumptions to determine managers input assumptions. Note, we simply add up mean and covariance because Managers Tracking Error and Assets Returns are independent by construction. Next we can create managers efficient frontier, such that all portfolios on this frontier will have target asset allocation, as implied from each manager’s style analysis. The last step of the Asset Allocation process is to decide how and when to rebalance: update the portfolio to the target mix. You can potentially rebalance daily, but it is very costly. A good alternative is to rebalance every time period, i.e. 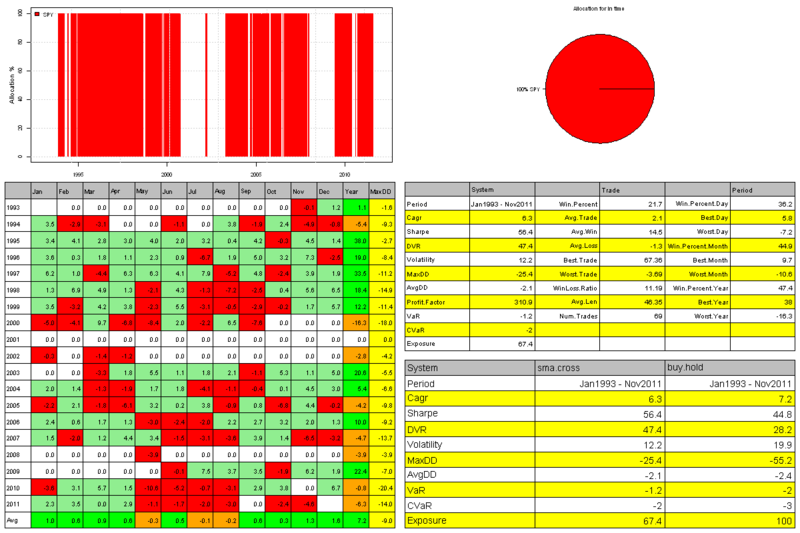 quarterly, annually, or set boundaries, i.e. if asset class weight is more than 3% from it’s target then rebalance. All these steps include some quantitative and qualitative iterations. I highly recommend experimenting as much as possible before committing your hard earned savings to an asset allocation portfolio. All style weights are between 0% and 100%. The sum of style weights is equal up to 100%. The last style allocation looks more probable. If historical fund’s holdings were readily available we could have examined them to refine the upper and lower boundaries. 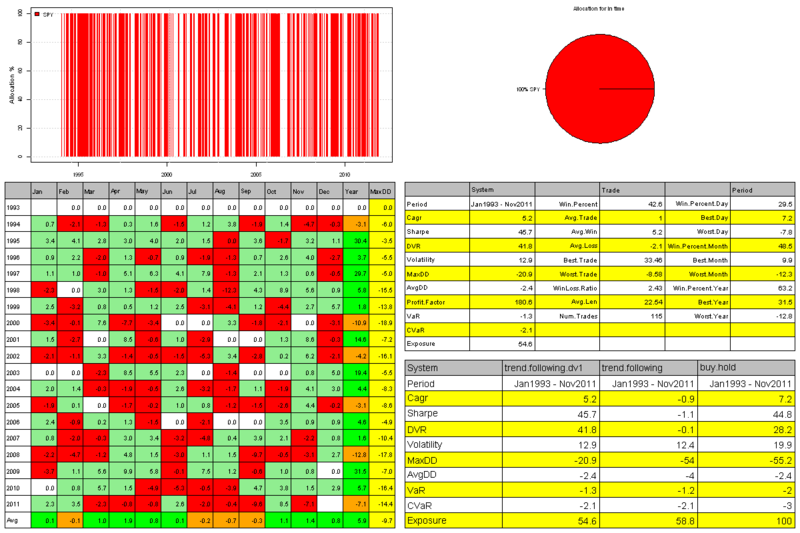 The last step is to analyze fund’s actual returns vs returns implied by its style matrix. 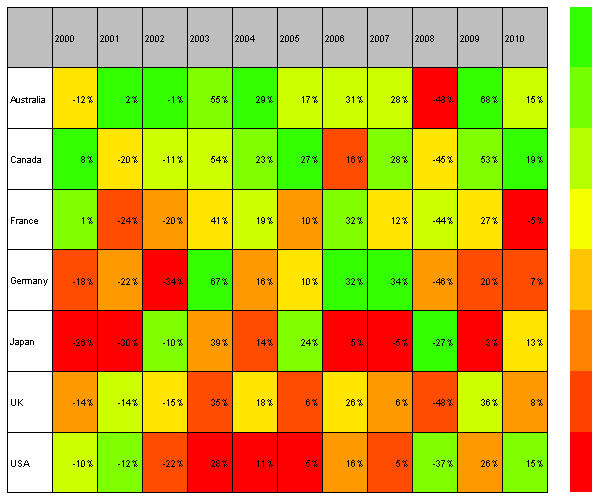 The Fidelity Worldwide Fund outperformed its proxy, implied from the style matrix, consistently over the last decade. The fund’s alpha is 2.9% and standard deviation of alpha is 3.9%. So if you want to invest into Worldwide Fund, the Fidelity Worldwide Fund is not a bad choice. To view the complete source code for this example, please have a look at the aa.style.test() function in aa.test.r at github. 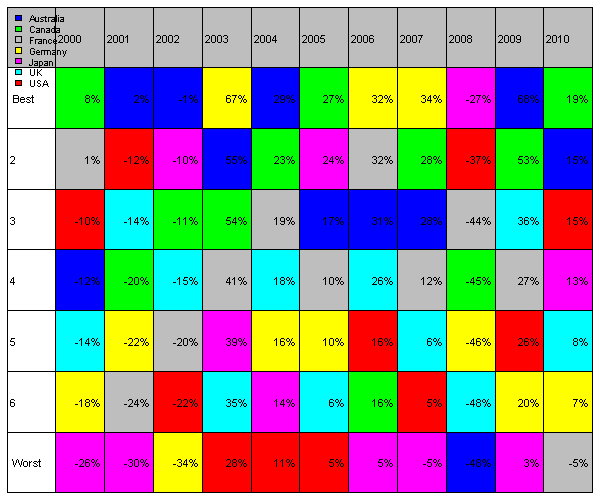 To get a better sense of historical data, I like to examine a Periodic Table of Investment Returns. For an example of a Periodic Table, have a look at the Single Country Index Returns Periodic Table for 2001-2010 published by iShares. I can easily create a similar table with the following R code, using the historical data from the Black-Litterman Model post. 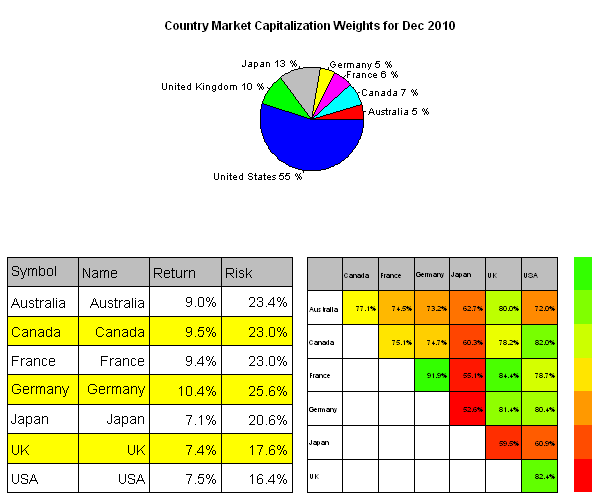 The Canadian and Australian markets outperformed US and Japanese markets in most years. To view the complete source code for this example, please have a look at the aa.periodic.table.test() function in aa.test.r at github. 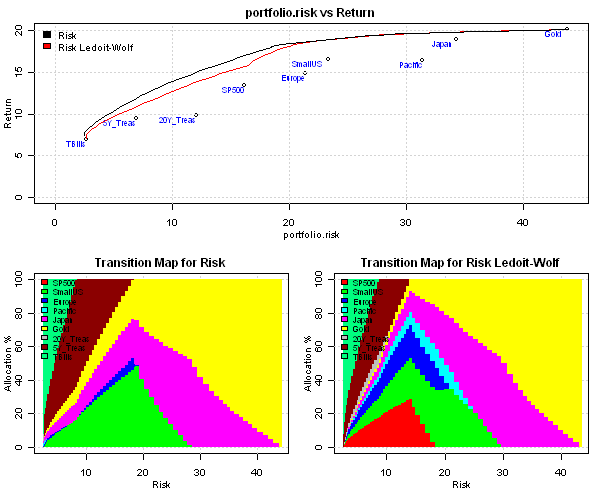 Lack of diversification of portfolios on the mean-variance efficient frontier. Instability of portfolios on the mean-variance efficient frontier: small changes in the input assumptions often lead to very different efficient portfolios. I recommend a very good non-technical introduction to The Black-Litterman Model, An Introduction for the Practitioner by T. Becker (2009). I will take the country allocation example presented in The Intuition Behind Black-Litterman Model Portfolios by G. He, R. Litterman (1999) paper and update it using current market data. World Development Indicators database at the World Databank. 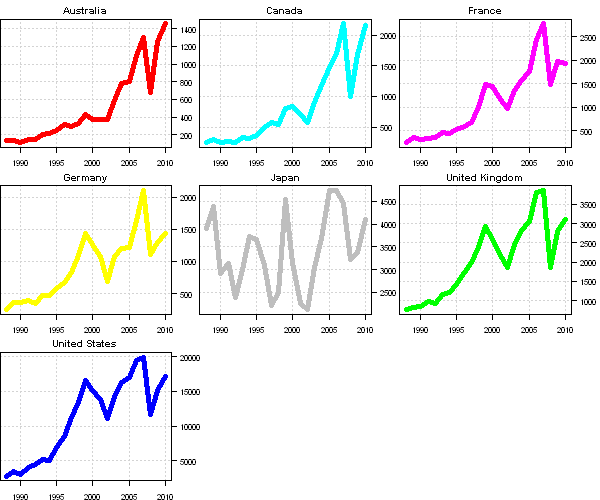 First select countries, for series type in “capitalization”, and last choose years. I will use market capitalization data from World Databank. There is a major shift in weights between Japan and USA from 1988 to 2010. In 1988 Japan represented 47% and USA 33%. In 2010 Japan represents 13% and USA 55%. 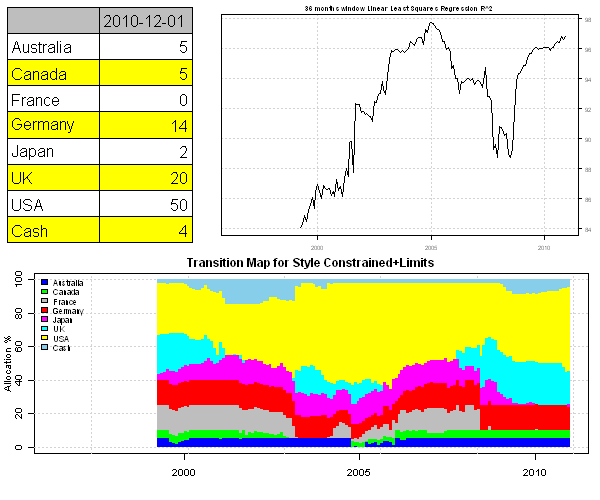 The shift was driven by inflow of capital to USA, the Japaneses capitalization was pretty stable in time, as can be observed from time series plot for each country. The first step of the Black-Litterman model is to find implied equilibrium returns using reverse optimization. 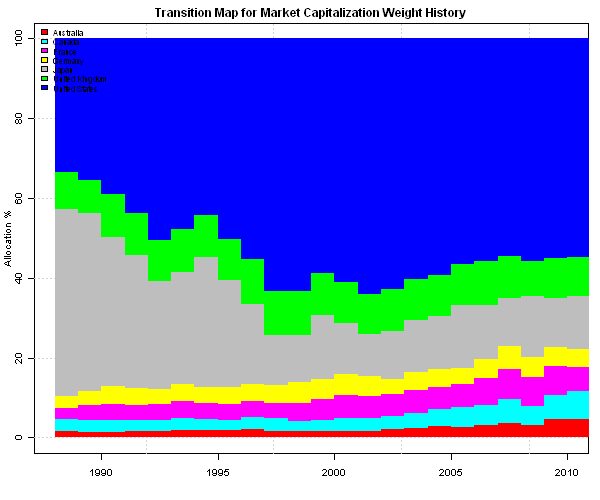 where are equilibrium returns, is risk aversion, is covariance matrix, and are market capitalization weights. 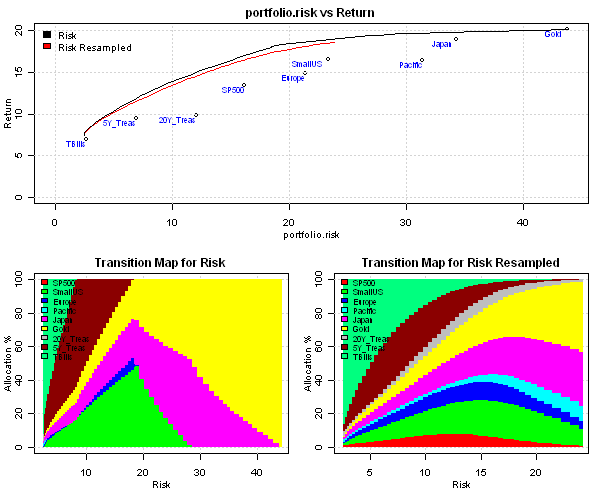 The risk aversion parameter can be estimated from historical data by dividing the excess market portfolio return by its variance. 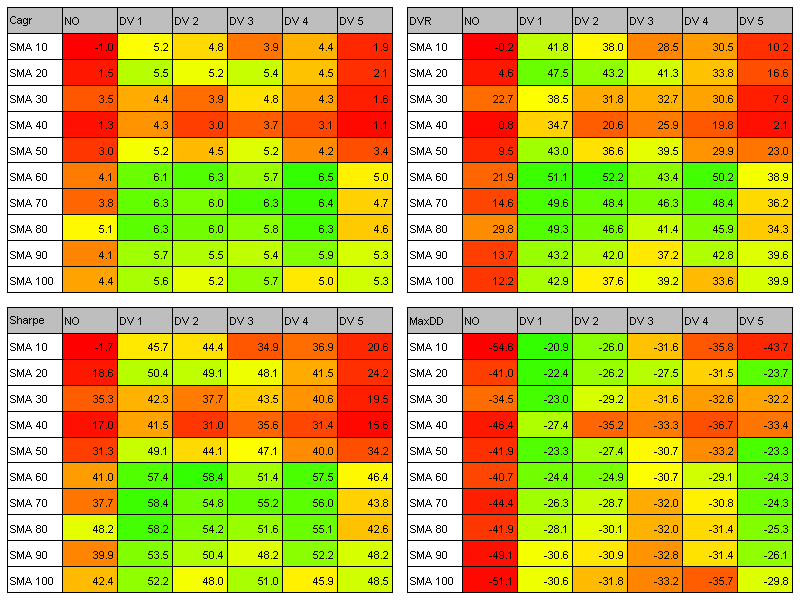 Comparing the transition maps, the Black-Litterman efficient portfolios are well diversified. Efficient portfolios have allocation to all asset classes at various risk levels. By its construction, the Black-Litterman model is well suited to address the diversification problems. where P is Views pick matrix, and Q Views mean vector. The Black-Litterman model assumes that views are . 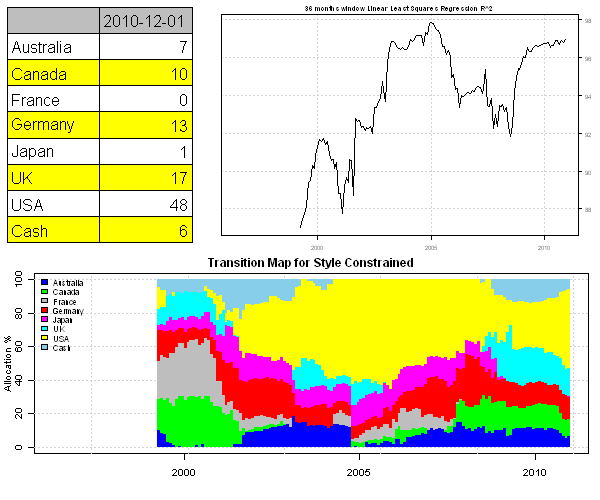 Comparing the transition maps, the Black-Litterman + Views efficient portfolios have more allocation to Japan and Australia, as expected. The portfolios are well diversified and are not drastically different from the Black-Litterman efficient portfolios. 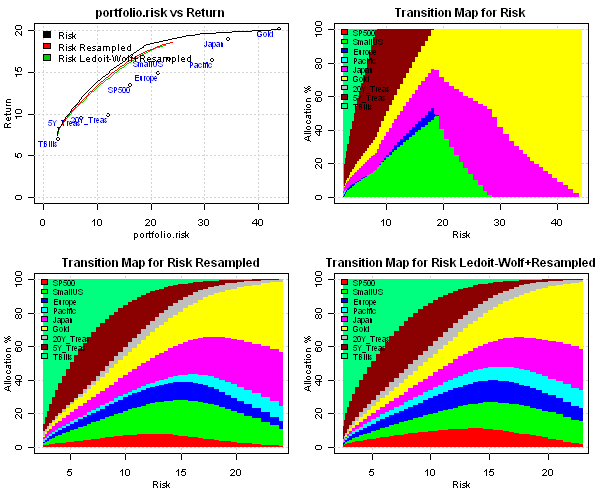 Lack of diversification of portfolios on the mean-variance efficient frontier. 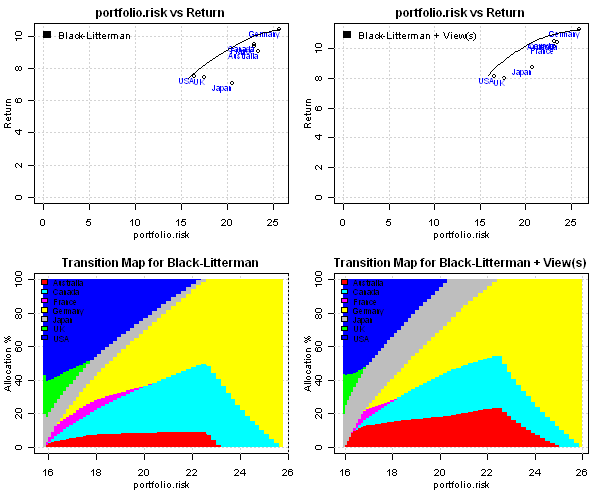 The Black-Litterman model uses equilibrium returns implied from the current market capitalization weighs to construct well diversified portfolios. 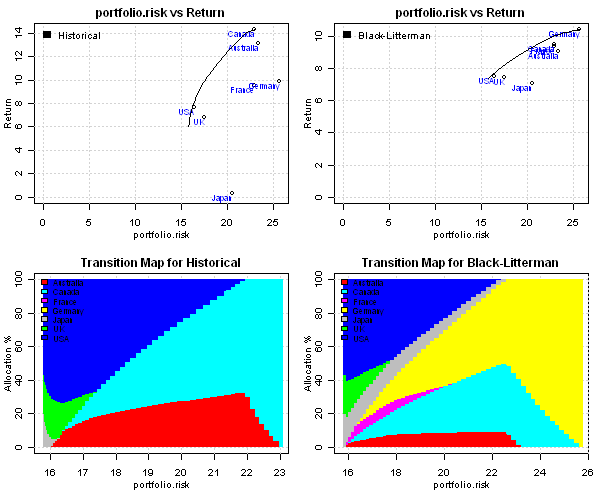 Instability of portfolios on the mean-variance efficient frontier. The Black-Litterman model introduces a mechanism to incorporate investor’s views into the input assumptions in such a way that small changes in the input assumptions will NOT lead to very different efficient portfolios. Jay Walters also gathered a collection of Implementations of the Black-Litterman Model at his site. Beyond Black-Litterman in Practice: A Five-Step Recipe to Input Views on Non-Normal Markets by A. Meucci (2005) accompanied by Matlab code. Fully Flexible Views: Theory and Practice by A. Meucci (2008) accompanied by Matlab code. To view the complete source code for this example, please have a look at the aa.black.litterman.test() function in aa.test.r at github. Small changes in the input assumptions often lead to very different efficient portfolios constructed with mean-variance optimization. I will discuss Resampling and Covariance Shrinkage Estimator – two common techniques to make portfolios in the mean-variance efficient frontier more diversified and immune to small changes in the input assumptions. Resampling was introduced by Michaud in Efficient Asset Management, 2nd edition. Please note that the Resampling procedure is patented portfolio optimization process. (Richard Michaud and Robert Michaud co-inventors, December 1999, U.S. Patent # 6,003,018, worldwide patents pending) The use of this technology that includes include even personal use, requires licensing or authorization. Step 0: Estimate mean (Mu*) and covariance (Cov*), for example from historical assets returns. Step 1: Sample from multivariate normal distribution with mean=Mu* and covariance=Cov*. Step 2: Compute sample mean and covariance, and use them to create efficient frontier. Step 3: Save portfolio weights that are on efficient frontier. Repeat Steps 1,2,3 Number of Samples to draw times. Step 4: Average over saved portfolio weights to obtain final portfolio weights that lie on the Resampled Efficient Frontier. Update: please note that due to the above patent, I cannot post the source code for the resampling function and that makes examples below not reproducible. The Resampled Efficient Frontier is visually superior to the the mean-variance efficient frontier. It is better Diversified: allocation to all asset classes is present and transition between portfolios is continuous and smooth, no sharp changes. The Resampled Efficient Frontier is also, by construction, immune to small changes in the input assumptions. The central message of this paper is that nobody should be using the sample covariance matrix for the purpose of portfolio optimization. It contains estimation error of the kind most likely to perturb a mean-variance optimizer. In its place, we suggest using the matrix obtained from the sample covariance matrix through a transformation called shrinkage. This tends to pull the most extreme coefficients towards more central values, thereby systematically reducing estimation error where it matters most. Statistically, the challenge is to know the optimal shrinkage intensity, and we give the formula for that. Without changing any other step in the portfolio optimization process, we show on actual stock market data that shrinkage reduces tracking error relative to a benchmark index, and substantially increases the realized information ratio of the active portfolio manager. a is a shrinkage constant, a number between 0 and 1. This technique is called shrinkage, since the sample covariance matrix is `shrunk’ to-wards the structured estimator. The Shrinkage Target, F, is modeled by constant correlation model. The model says that all the (pairwise) correlations are identical. The average of all the sample correlations is the estimator of the common constant correlation. The Efficient Frontier constructed with Ledoit-Wolf Covariance Shrinkage Estimator is better Diversified: allocation to all asset classes is present and is also, by construction, immune to small changes in the input assumptions. Shrinkage is not the only solution, there are many alternatives ways to estimate Covariance matrix. For example, Pat Burns at Portfolio Probe blog, discusses estimation of Covariance matrix with factor models: A test of Ledoit-Wolf versus a factor model. Another interesting idea is to combine Resampling with Shrinkage was examined in the Resampling vs. Shrinkage for Benchmarked Managers by M. Wolf (2006) paper. It is very easy to implement because we only need to change Step 2 in the above algorithm. Instead of using sample covariance matrix, we will use it’s Shrinkage Estimator. 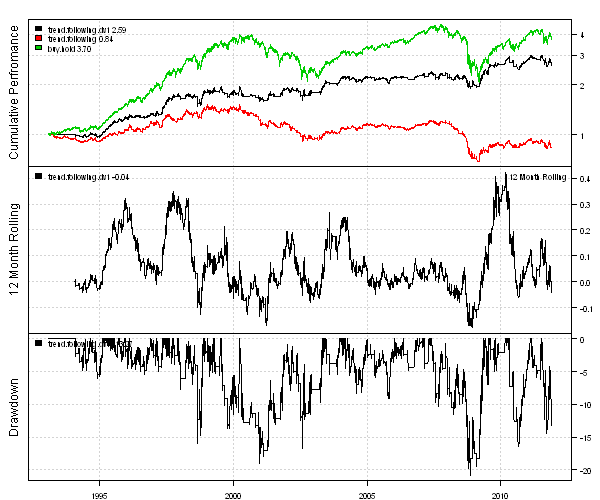 Both frontiers are close and have very similar portfolio composition. So it’s hard to say if adding covariance shrinkage estimator to the resampling algorithm is beneficial. In conclusion, there are findings for and against that these methods will improve out-of-sample returns. However, these methods will surely reduce portfolio turnover and transaction cost associated with rebalancing by making portfolios on efficient frontier immune to small changes in the input assumptions. In the next post I will discuss the Black–Litterman model that addresses both Instability and Diversification problems of the portfolios on the mean-variance efficient frontier. To view the complete source code for this example, please have a look at the aa.solutions2instability.test() function in aa.test.r at github.